Is Notarization Compulsory For Rental Agreements In India? 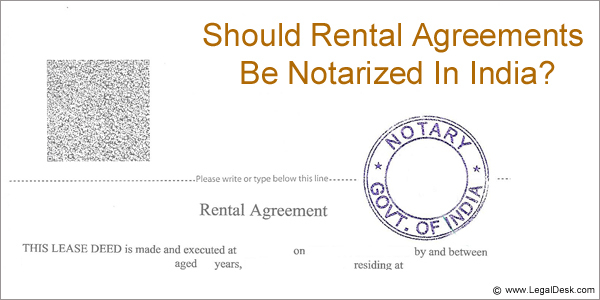 Should Rental Agreements Be Notarized In India? Rental agreements are the focal point of a rental transaction. It is a contract which lays down the basic guidelines expected to be followed by both parties. Since the law will consider the rental agreement as a primary evidence, should there be a dispute between the parties involved, it is vital that you draft the agreement well and follow proper protocol to make it legally valid. Before we get into that, have a look at what a rental agreement should contain. In India, it is not mandatory to notarize a rental agreement. As long as it is printed on Stamp paper and is signed by both parties and by two witnesses, it is considered binding. However, if you wish to notarize it, you may do so. The job of the notary is to verify everything in the document and attest the document once everything is found to be genuine about the document as well as the deponent. A Notary public is someone appointed by the State/ Central Govt. and his/her primary duty is to deter frauds and forgeries by overseeing/witnessing document signing and authenticity verification. Apart from this Notary Public also performs duties such as oath administration, affidavit signing, record maintenance and performing marriage ceremonies. On the other hand, registration is compulsory in most States, if the term of the lease is anything more than 11 months. Under 11 months, both registration and notarization can be overlooked. However, if you still wish to get your deed notarized, here’s the procedure for it. It is fairly simple, so it should take you very little time. These are just the basic things expected in a rental agreement. However, if the parties involved have more clauses, they are free to add clauses of their choice as long as both parties consent to it. What should be done after the agreement is drafted? As soon as you draft your rental agreement, make sure that it is reviewed by both parties. After this, proceed to register your document. Do not confuse registration with notarization as both are two different actions. Notarization generally refers to verification and giving a seal of authenticity to a document. This is performed by a Notary who is appointed under the Notaries Act. Registration on the other hand in registering the document with a local Sub-Registrar office. The procedures for both are governed by different Acts and can therefore be considered as two entirely different procedures. Most tenants complain that these days half the job in a rental transaction is to get someone to draft a solid rental agreement that covers all contingencies. As a badly drafted rental agreement can destroy your peace if something goes wrong, many prefer to approach lawyers to do the job. This is, needless to say, time consuming. 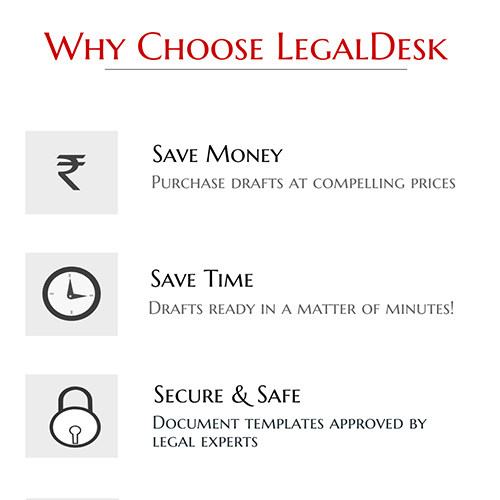 Which is why LegalDesk presents you a better option. Our team specializes in producing pre-drafted, lawyer verified, ready to use rental agreement templates. Our deeds are legally perfect and they can be customized in a matter of minutes. Plus, you get to do it from the comforts of your home. We can even print it on Stamp Paper of recommended value and deliver it to an address of your choice! Isn’t that great? To make your rental agreement online, start here. There are 1 comment on "Should Rental Agreements Be Notarized In India? ".